Overview : Fans of the old school Neo Geo console have been getting their fix of their favorite games the Wii’s Virtual Console for a while now. But playing those classic games using a Wii-mote or crummy gamepad controller just can’t compare to the Neo Geo’s original arcade controller. 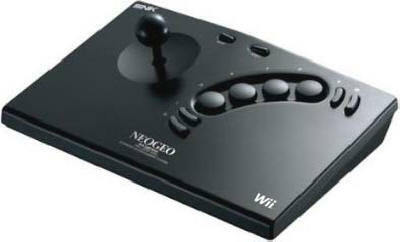 The Neo Geo Wii arcade stick 2 can be compatible with all your virtual console games. It connects directly to your Wii and lets you play your favorite old games properly. The stick is based on the original Neo Geo controller, complete with arcade joystick and a great button layout for playing fighting games and the like. Based on SNK's Neo Geo stick. Suitable for Virtual Console games. Quality/Usability : My hands have been itching to play Neo Geo games. Yes, they are available on the Nintendo Wii's Virtual Console but its not the same playing it on a controller. How can you play Puzzle Bobble or World Heroes on a controller or let alone on the Wiimote? Someone from SNK Playmore must of been reading my mind because SNK has released an arcade stick called the Neo Geo Stock 2. It resembles the original Neo Geo Stick for the Neo Geo...even the black color. Since this is two different consoles, there are some minor cosmetic changes. The Neo Geo Stick 2 has the same four round buttons (B, A, Y, X) which are laid out in a slight curve. At the end of these buttons, there are two additional buttons on the bottom and top of the four buttons (ZL, L and R, ZR respectively). The top contains the SELECT and START. To the left is the eight directional joystick. First game I had to try was Puzzle Bobble. When I was young, I loved this game so much that I would play this game everyday after school at my local comic book shop. I used my WiiPoints and purchased the Virtual Console game. It was not the same playing it on the WiiMote or classic controller. With the Neo Geo Stick 2, it brought back memories whoever, the stick wasnt as smooth as the arcade. Than again, the arcade stick was used a lot more than the NGS2 so it was broken in. Like all console arcade sticks, the joysticks have a clicky feel to it but that didnt stop me! Next game I had to try was a fighting game. I went and purchased World Heroes and Fatal Fury. World Heroes was another favorite of mine when I was growing up. I wasn't a big fan of fighting games and still probably not. I was a button smasher when I was growning up playing video games. I probably still am. The controls were great and was able to get my moves off...from what I can remember without having to smash buttons =). And my all time favorite....Metal Slug. Your Virtual Console and Neo Geo experience is not complete with this classic! I've owned this game at one time or another on the Neo Geo Pocket, DS, PS2, Xbox, etc. Like the previous games, the NGS2 controlled great and I had no problem shooting enemies or aiming/controlling my weapon. The quality of the controller is very high. Buttons, joystick and the base was very sturdy. I dont lightly tap my arcade sticks...I pound on them. The NGS2 connects to the Wiimote just like the Classic Controller. There is no rumble support but would of been a nice feature. Conclusion : Overall, the Wii SNK Neo Geo Stick 2 is a must for those who have Neo Geo Virtual Console games. Playing Neo Geo games is not complete until you have this arcade stick. It would be nice if all these arcade sticks that are available dont have a clicky joystick. That's just my preference. This arcade stick was released only in Japan so you can only order this from videogame importers. No word or plans to release this else where. Price is also steep at $59 but well worth it.